I’ve never had the pleasure of commissioning a work of art, but I’m pretty sure it doesn’t involve pictures of amorphous chrome blobs. Bentley hopes to elevate the somewhat mundane process of ordering a car into an artistic experience with the new Bentley Studio that opens this week in New York City’s trendy Meatpacking District. Those strange images are an integral part of the process. Upon arriving at the Manhattan studio, I was given a key card and escorted to a kiosk to begin selecting the color scheme of an embryonic Bentley. At each kiosk is a screen that presents the user with two images. He or she must choose from at least 20 of these image pairs to get a result. The images themselves include things like that chrome blob (it’s a sculpture), a boat on a vivid blue sea, close ups of skyscrapers, and a picture of stacked firewood. They seem fairly random, but each image emphasizes a specific color, and represents some kind of action (or inaction), newness, or oldness. Next, it’s time to review the chosen images, which are shown as a constellation of circles on a large screen in the back of the studio. However, there’s not clicking or scrolling involved: It’s all done by hovering a hand over a motion-sensitive controller, which makes one feel like Tom Cruise sifting through evidence in Minority Report. What does all of this have to do with building a Bentley? Like an ultra-luxury Rorschach test, the company’s designers have developed a system that correlates image choices with certain colors, and statements about the customer’s attitude. The images are plotted on a graph with axes running from “Legacy” to “Future” and “Serenity” to “Adrenaline”, respectively. It looks psychoanalysis is now part of the Bentley commissioning experience. There’s no straight rule about which images land in which category, the system instead relies on subjective connections. A picture of a concert, for example, has a high “Adrenaline” factor not only because of the prevalent orange glow of the stage lights, but also because it depicts an exciting activity. The next stage is decidedly less avant garde. After the precogs generated a color palette for me, I sat down with a Bentley design consultant imported from the factory in Crewe, England, to see how the colors would look on an actual car. Each customer gets to look at a “mood sketch”, a streak of pastel over a basic outline of the car. It’s as effective as it is charming, emphasizing the color while giving the viewer more context than an ordinary swatch would (Bentley had those, as well as leather samples, on hand as well). Everything else is pretty straightforward. The actual “building” of the car is done using an online configurator similar to what you’d use to order just about any other car, but with many Bentley-specific options, of course. Choosing the interior of a Bentley is about as complicated as furnishing a medium-sized house. For one, there are more leather-hide colors available than exterior paint colors on some, less expensive cars, and they can be combined in two-tone layouts, and accented with contrasting stitching. Next, I had to consider the details of “my” Bentley, such as trim pieces (carbon fiber, various woods, and engine-turned aluminum are available, depending on the model), whether I wanted a two-tone steering wheel, and any bespoke touches. You can, for example, have your family crest or company name embroidered on the headrests. This is also the time to specify any factory options, such as an upgraded sound system. The staff then compiles all of these choices into a neat brochure, which customers can take to a Bentley dealer to complete their orders. 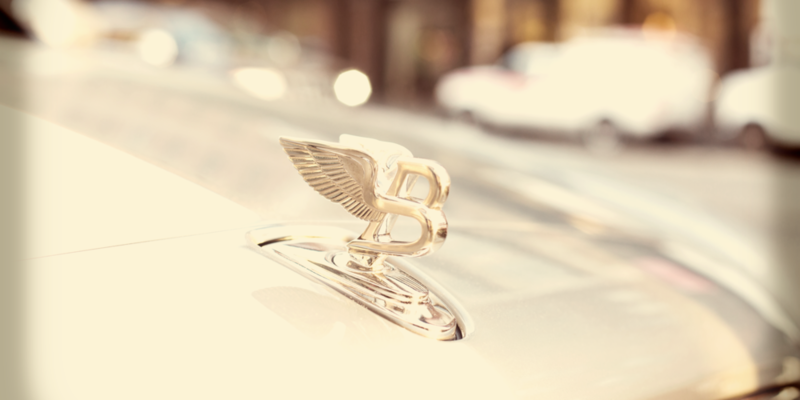 The whole process may seem a bit gimmicky, but Bentley believes it will inspire a bit more creativity among customers. It should also inspire a few more orders for custom-designed cars. By essentially randomizing the choices, the Bentley Studio gives customers a way to navigate the myriad options available. Choosing the color of your $245,000 Continental GT Speed by looking at a picture of some trees might appear strange, but it’s less daunting than thumbing through dozens of hues without knowing where to start. It’s also possible that the techie aspect may simply pique the curiosity of customers with the cash to spend on a customized car, an important market segment for Bentley and other rarefied brands like Aston Martin and Rolls-Royce, which are both touting their own bespoke programs. Because a traditional dealership might be fine for ordering a car, but it’s not the place to commission a work of art.